Approaching joint assessment from the perspective of “cylinders”. Our approach to every joint assessment has long been to visualize and assess the joint(s) as a cylinder since the body parts are cylindrical in form. This has been our approach, and they way we teach, for many years. At each number on the clock (cylinder) there is a theoretical muscle that provides stability to the joint in that vector during loading. The most accurate assessment would be one that investigates the ability of each muscle around the clock (cylinder) to see if it has sufficient S.E.S. (Skill, Endurance, Strength) as well as how well that muscle(s) participates with the synergists, antagonists and agonists (ie. motor patterns for stability and mobility). We do this at each joint along the kinetic chain when assessing someone with a clinical or functional problem. When dealing with a frontal plane drift, as in the 3rd photo above where you see the person’s (black shorts) pelvis drift laterally outside the perpendicular foot line, one could naturally assume that the gluteus medius is weak (9 o’clock) but the wise clinician would also look at the other side of that cylinder to see if the adductors were involved (3 o’clock) since that is 180 degrees through the joint axis. (Note: Runners are sagittal athletes so frontal plane weaknesses are often seen. This is not desirable however, this is a perfect example why runners should cross train more into lateral and angular sports to ensure that the sagittal plane does not dominate.) Obviously the foot and the knee also need a similar cylindrical assessment approach. We have spoken loudly many times here and on our podcasts over the years that quite often there are multiple flaws in a presentation, typically a focal cause and one if not several compensations as a functional adaptation strategy around that central flaw. In this runner’s case there could be medial knee weakness or foot weaknesses that are affording too much medial drift and spin of the limb resulting in the lateral pelvic drift compensation. But, just because the gluteus medius shows up weak does not mean that it is the focal point of clinical intervention. If one facilitates the gluteus medius and does not address the causative lower cylinder issues then they are quite possibly empowering the compensation and enabling the aberrant activity to continue. Knowingly or unknowingly layering armor or inappropriate strength to a pathologic compensation pattern at a focal joint level that is not the focal cause should be a clinical crime, but it is done every day by people who do not know better even though their efforts are well intended. Ok, we got on a bit of a soap box rant there, sorry. Back to the case at hand. Your assessment should not stop at the frontal plane in this case. If there is an imbalance in the sagittal plane in this sagittal athlete this can be a causative problem as well, which is why the cylinder approach should not stop at the frontal plane or when you find that first major weakness. In frontal pelvic drift cases, there is quite often an anterior pelvic tilt where the lower abdominals can be weak, the low back is slightly extended and the paraspinals are more active. This is the classic “impaired hip extension pattern” and sets up a Janda/Lewitt style “Layered Syndrome”. Most of the time, resolving this sagittal flaw will show immediate improvement of the frontal plane deficits. But, do not think it is as simple as re-facilitating these 2 patterns. Remember, neuromotor reprogramming and patterning takes 8-12 weeks by some sources. And remember, the initial strength gains in the first few weeks are from neuroadaptation (ie, skill gains in coordination), these gains are not the true physiological endurance and strength gains that we desire for an athlete. Those gains take time but they are the ones that we need for sport performance and joint power. And then there is the rotational or axial component, which we did not even begin to discuss here. We have briefly talked about the frontal and sagittal cylinder aspects, and yes, we have just skimmed the surface as there are multiple patterns and issues which we have had to leave out here so that this doesn’t turn into a full fledged chapter for our next book. This stuff gets complicated and can leave you running in mental circles at times. But these concepts will help you better understand why you often see neuro-protective tightness 180 degrees on the other side of the cylinder from tightness, and when you address the weakness the other side of the cylinder some of that neuro-protective tone is eased. But again, it is not nearly this simple because you must remember that if your assessment is static or on a table then your findings will be functionally imprecise. And, not stopping there, there are multiple joints below the joint you are focusing on, and multiple joint complexes above as well. Plus, there are 3 other limbs that can play into the function and dysfunction of a given limb and its joints. There are breathing patterns, postural patterns and many other issues. This is not an easy game to play, let alone play it well or wisely for your athlete. In today’s photos we wanted to show you 3 runners. One a distance runner with good joint stacking and one sprinter with amazing joint stacking. And then the runner in the black shorts, who cannot stack the foot, knee or hips even remotely well. This runner in the back shorts will have the cross over gait and likely have the medial ankle scuff marks to prove it. But remember, there is one component that we often talk about, one we did not discuss here … . . are there also torsional issues in this runner ? Do they have femoral or tibial torsion(s) ? What is their foot type ? Are they in the right shoe for their foot type ? Are some of these components playing into their visibly flawed mechanics ? Below is an article we have put up here on the blog previously. It is a study where the investigators examined hip abductor strength (watch this video here ) in distance runners with iliotibial band syndrome comparing injured limb strength to the unaffected limb to determine whether correction of the strength deficits in the HAM’s (hip abductor muscles) correlates with successful outcomes. The study showed the obvious, that runners with ITBS have weaker HAM strength compared to the asymptomatic leg. But here is our question, did they just strengthen the compensation for an apparently successful outcome, or did they address the problem ? Only time will tell if you actually fixed something or merely enabled the dysfunctional motor pattern by layering it with more armor for the next battle. If it is fixed the problem and all of its associated problems should go away. But if the runner comes back weeks later with knee complaints, foot pain, back pain or the like … . . then the message should be loud and clear. Shawn and Ivo, The Gait Guys……today with soap on the bottom of our feet. Clin J Sport Med. 2000 Jul;10(3):169-75. Hip abductor weakness in distance runners with iliotibial band syndrome. Fredericson M, Cookingham CL, Chaudhari AM, Dowdell BC, Oestreicher N,Sahrmann SA. Department of Functional Restoration, Stanford University, California 94305-5105, USA. Risks and Understanding Band assisted Ankle mobilizations, bunion correction, Plyo jumps on inclines and more ! 4. Band assisted ankle mobilizations. Do you know what you are doing ? I have a patient who is suffering MS… . I am a fitness instructor, and teach mostly barefoot classes…Pilates, yoga, willPower & grace. One of my students came to me originally because she has had bunion surgery, and wanted to regain alignment and strength in her feet. She is doing well with her big toe, but due to compensations made for the bunion, she has this pronounced protrusion of the lateral edge of the foot by her 5th toe and metatarsal. It looks larger in person than it does in the photo and is painful for her. What is the cause and are there specific exercises for her? 8. From Men’s health magazine: Doing plyo jumps on an incline !? 9. From the field doc: Dr. Rothbart himself ! Dear Dr Allen and Dr Waerlop, … . J Manipulative Physiol Ther. 2013 Jul-Aug;36(6):359-63. doi: 10.1016/j.jmpt.2013.06.002. Epub 2013 Jul 3. Effect of customized foot orthotics in addition to usual care for the management of chronic low back pain following work-related low back injury. The findings showed that patients in this study with chronic, nonspecific low back pain following work-related low back injury had greater improvement in short-term outcomes with orthotics and UC than with UC alone. Here is a runner, wanting to be an ultra runner, who recently developed right sided knee pain while running a 50K. He was pacing another individual and developed pain on the outside (lateral patella and knee) on the right, ascending and especially descending hills. The pain is dull and achy. He is able to “push through” the pain, but if he does, it remains painful for a few days. He has an anatomically short leg on the L (tibial). There is no significant tibial torsion (he has normal external version) and not femoral torsion. There are adequate amounts of internal (>15 degrees) and external (>30 degrees) rotation of the hips. He has 7 degrees ankle dorsiflexion on the right, 10 degrees on the left. On the table (and in the video) he has 0 degrees of hip extension during passive motion, walking and running. He has weakness of the long extensors of the toes, as well as the abductors. Why does the right knee rotate less than the left? When folks have a short leg, we generally expect that leg to remain in supination (thus external rotation) more and the longer leg to internally rotate more, due to excessive pronation. But here, we see the opposite. You will notice he has a rearfoot valgus on the left. This means the midtarsal joint is in a greater amount of pronation on the shorter side. For every action, there is an equal and opposite reaction. In this case, less pronation (or supination) on the longer leg side. Remember, we said generally folks pronate more on the long leg side. This is one of the exceptions. So, should he throw away his shoes? The shoes, which have a certain amount of torsional rigidity, are compounding the problem. The Brooks Cascadia is an excellent trail running shoe, he just needs something with less torsional rigidity. the shoe does not allow his knee to come midline sufficiently. Since he is a Brooks Fan, we suggested the “Grit” in the Pure line. 4mm drop and less rigid torsionally. He could also work his way into a “Drift” (4mm or zero drop, extremely flexible). Why does he lean to the left on stance phase on the left? Most likely, to clear the right long leg on swing phase. This is one of the 5 common strategies. For more strategies, click here. Why is it better when he is barefoot? It must mean he should be a barefoot runner, right? The Gait Guys. Making you a better diagnostician, with each and every post. 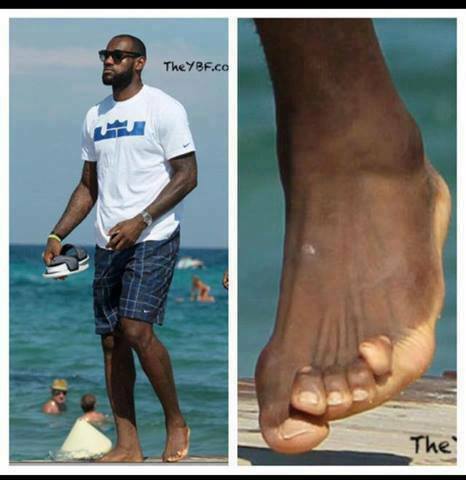 Lebron James and his funky toes. We have the scoop as to what is going on. This is what happens when you get too much short extensor tone and/or strength in the digits of the foot. Now this is his trailing foot and he has moved into toe off so he should be activating his toe extensors and the tibialis anterior (ie. the anterior compartment) to create clearance for that foot so that he doesn’t catch the toes on the swing through phase of gait. In this case we do not see alot of ankle dorsiflexion (which we should see at this point) so we are seeing a compensation of perhaps increased short extensor (of the toes) activity. We also see what appears to be a drifting of the big toe (the hallux) underneath the 2nd toe. This often happens when a bunion or hallux valgus is present. Now we do not see a bunion present here but the viewing angle is not optimal however it does appear that there is a slight drift of the hallux big toe towards the lesser toes . We are not sure if we would qualify this as hallux valgus, and if so it is mild, but none the less we see a slight lateral drift. What is interesting is that despite the obvious activity of the lesser toes short extensor muscle (EDB) we do not see a simultaneous activity of the short extensor of the hallux (EHB, extensor hallucis brevis). Does he need to do our exercise ? See video link here ! And so, when the lesser toes are in extension as we see here and the big toe is not moving into extension, and when that is simultaneously combined with even a little hallux valgus tendency, the big toe will drift underneath the lesser toes as we see here, even appearing to push the 2nd toe further into extension. As for his little toe, well, Dr. Allen has one just like it so perhaps he missed his calling in the NBA. Some folks just do not have as plantarward orientation of the 5th toe and so it migrates upward (dorsally) a little. This can be from birth but it can also come from trauma. But in time because the toe is not more plantar oriented, the dorsal muscles (the extensors) become more dominant and the toe just starts to take on this kind of appearance and orientation. It will reduce significantly when the foot is on the ground and the extensors are turned off, but it looks more shocking during the swing phase because of the extensor dominance in that phase. This kind of presentation if left unchecked can lead to hammer toes, plantar fat pad migration distally exposing the metatarsal heads to more plantar forces without protection and a host of other problems. Lebron needs to do our Shuffle Walk Exercise to get more ankle rocker (dorsiflexion) and also work to increase his long toe extensors (EDL) and lumbricals. This will flatten his toes and improve mechanical leverage. Remember, if you gait better foot function with increased ankle dorsiflexion you will get more hip extension and more glute function. But does the big fella really need to jump any higher? We are sure he would accept being faster though … . who wouldn’t ? Fee for today’s long distance consult: … Lebron, lets say 10,000$ and we will call it even. Sound good ? But a lifetime of prettier, stronger and more functional toes……priceless. Have your people contact our people. (Ok, we don’t have people, but we do have an email address here on our blog !). Shawn and Ivo, The Gait Guys. Even helping the elite, little by little. Our show notes should interest you today. We have another great podcast ready for you ! Hello there, I’ve been following your stuff for a while now after searching far and wide for solutions to issues I have with my feet/ankles … . .
Regulation of arm and leg movement during human locomotion. J Am Podiatr Med Assoc. 2012 Sep-Oct;102(5):390-5. Anatomical origin of forefoot varus malalignment. Lufler RS, Hoagland TM, Niu J, Gross KD. Forefoot varus malalignment is clinically defined as a nonweightbearing inversion of the metatarsal heads relative to a vertical bisection of the calcaneus in subtalar joint neutral. Although often targeted for treatment with foot orthoses, the etiology of forefoot varus malalignment has been debated and may involve an unalterable bony torsion of the talus. There was no association between forefoot alignment and talar torsion (r = 0.18; 95% confidence interval, -0.11 to 0.44; P = .22).These findings may have implications for the treatment of forefoot varus since they suggest that the source of forefoot varus malalignment may be found in an alterable soft-tissue deformity rather than in an unalterable bony torsion of the talus.